The motivation for this fast update is an idea came out from a bugzilla discussion for an old request: the clear urlbar button. So, long story short. 2.3.2 is 2.3.1 working well. To know about changes from 2.3.0, please refer to 2.3.1 release blog. This release just focuses on bugfixing: first hint I had to add about is about qtwebkit version. In this “strange” period, where qt focuses on Qt5, QML and WebKit2, while we are still bound to Qt4 && Webkit1, I think we need to follow the unofficial QtWebKit 2.3.x branch, with its releases about (last should be QtWebKit 2.3.1). People reported, in this 40 days since rekonq 2.3.0 release, a lot of crash bugs that can be fixed just upgrading from QtWebKit 2.3.0 to QtWebKit 2.3.1. Don’t Save Sessions When Closing Tabs from Logout. This leaded rekonq thinking people was correctly closing browser on session close. The most “notable” one let us to move from “about:” to “rekonq:” protocol for our special pages. Here we are, finally ready for the 2.3.0 release. After the 2.2 one we targeted some things to fix and features to implement. We now are in the “almost done” level, meaning that quite all things have been done and that the code push is (hopefully) release level. – open url as webapp option. This “easy” feature has to be inserted in a wider view. So, please wait for my next post about it to. – session saving (load/save/rename sessions). As you guessed, you can now decide to save a session for future use, rename it and load when you prefer. 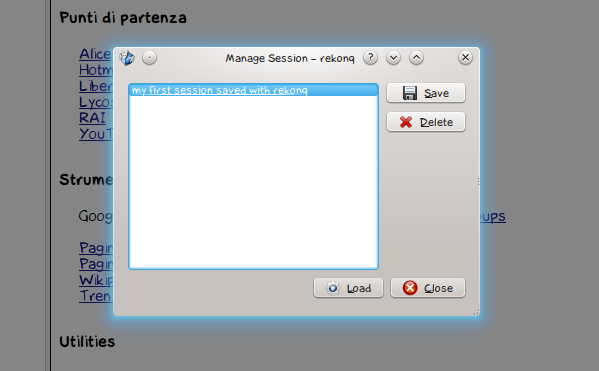 Moreover, you can decide to start rekonq showing the session dialog, loading one of the saved sessions. 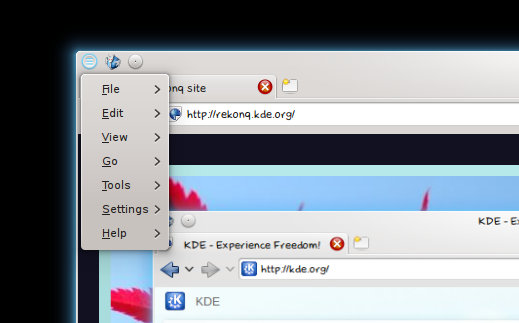 – some work on respecting one more of the thousand millions kde “wide” settings. – urlbar look change (not finished). SSL icon on the left as major browsers. coloring url text (yet) missing. We have problems when the urlbar is full and text start to “scroll” on the left. And I’d really like to have an “easier” widget here, allowing rich (colored) text, instead of pixel perfect subpainting. – Favorites (fast) management, the “opera” way (bye bye “love” icon). 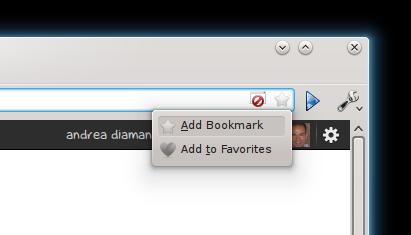 Just click on the star icon to set bookmarks and/or favorites. 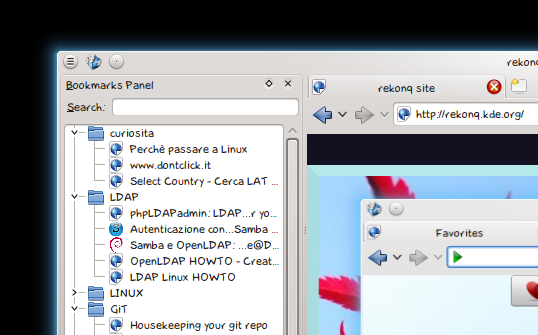 – appmenu-qt support. Just a missing dbus registration from the rekonq window. Easy to do (2 loc), hard to understand. Sorry for the noise, I just cannot decide. What do you prefer?